Weimaraner history, although difficult to trace, is believed to have begun as far back as the 16th century. In fact, an interesting tapestry that was woven in medieval times, shows dogs resembling Weimaraners surrounding a captured unicorn. 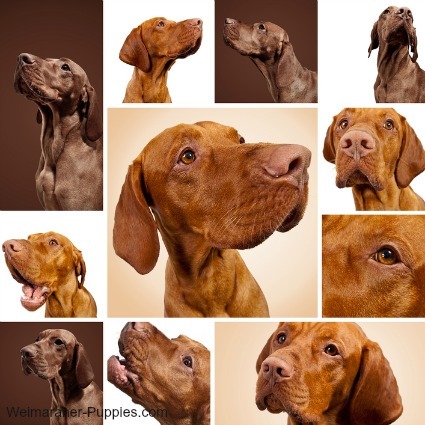 This could mean that Weimaraners have ancestors that go back even further! When considering dog breeding, the color gray is genetically recessive. The fact that Weimaraners are gray indicates that they have been selectively bred. to hunt bears, wild boars and deer. 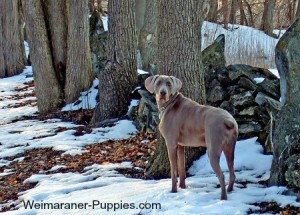 Our knowledge of Weimaraner history begins in Germany in the early 1800s. Dogs were bred to hunt large game—wild hogs, bears, wildcats and deer. And they were used to guard the estates of barons, making sure that the peasants did not steal from the nobility. Weims were valued companion hunters because of their courage and their instincts to protect their masters from fierce animals like wild boars and bears. 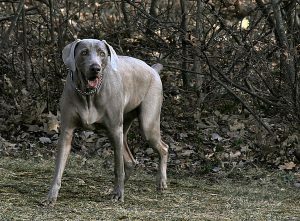 Strong, and swift of foot, Weimaraners would pick up the scent of an animal, run it down and then hold the animal down. All while baying until the hunter arrived. Gradually, as large game became more scarce, hunters began to train their Weinheimers to hunt birds. Since the dogs were trailing hounds and did not naturally point, they were crossed with pointer breeds, the Spanish Pointer being the most likely cross. 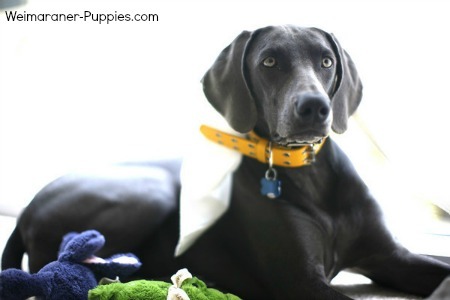 This cross breeding gave the Weim its distinctive size and light eye color. Weimaraners were noted for their strength and aggression when hunting. Today they mostly hunt birds in the U.S. The Weimaraner was developed principally for the Grand Duke Karl August and noblemen in the Court of Weimar in central Germany. With his powerful position, the duke insured that only the ruling classes in Germany were allowed to have pointer dogs, including Weimaraners. 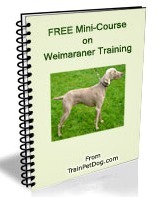 Thus the Weinheimer was truly an aristrocratic dog in Weimaraner history! However, unlike the other hunting dogs that stayed in kennels after a day of hunting, the Weimaraners were brought into their owner’s homes and served as companions, eating and sleeping near their masters. During the 19th century, the German upper class bred only a limited number of Weimaraners, and those were bred under very strict guidelines. 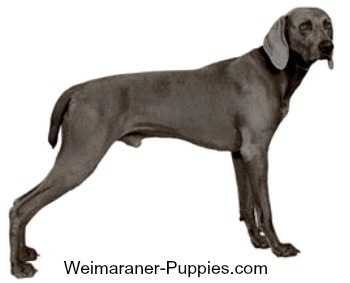 In 1897, the German Weimaraner Club was formed. The club directed the breeding of the dogs, making sure that any Weimaraners that showed any kind of weakness were not bred. The number of Weimaraners declined considerably after World Wars I and II in Europe. In 1929 Howard Knight joined the Weimaraner Club of Germany. He became educated on the club’s breeding policies, and he eventually imported two of these dogs into the U.S. Knight’s plan was to breed his dogs and start a line of Weimaraners in the U.S. Unfortunately for Howard Knight, the German Club sent him sterile dogs, despite Knight’s promise to uphold the purity of the breed. Finally, in 1938 Howard Knight got four breeding Weimaraners. Then in 1942, with the help of others, he founded the Weimaraner Club of America and the breed standard was established in the U.S. The American Kennel Club formally recognized the Weimaraner breed in 1942 and the breed appeared for the first time at the Westminster Kennel Club’s Dog Show. The Weimaraner belongs to the American Kennel Club’s Sporting Group. As such, they were bred to help hunters spot, flush and retrieve game. They are not bred to chase and kill game. They will bring game back to the hunter, as long as they are able to drag or carry it. Today Weimaraners hunt pheasants, quail and waterfowl like ducks. They are known as a “gentlemen’s dog” and work closely with their owners, hunting at a pace that is comfortable for the hunter. The hunter can count on his Weimaraner to be thorough in searching for game, just as Weimaraner history suggests in the past. And, while the dogs are great field companions, they are also wonderful companion pets for your family.